My story of becoming a scientist and publishing "Targeting the ATP-dependent formation of herpesvirus ribonucleoprotein particle assembly as an antiviral approach"
This paper in many ways reflects my journey of becoming a scientist. I would like to say it was all part of a big plan and I knew where we were heading straight from the start, but to be honest, it just kind of came together bit by bit. It started with my Wellcome Trust PhD funding scheme, which allowed me to undergo 3 rotations in different labs in the first year. During one of these rotations to decide where (and on what) I want to work on over the next 4 years, I heard a talk from a virologist who had successfully collaborated with chemists to screen for new antivirals. It was in a side remark to Prof. Adrian Whitehouse that I mentioned I would be interested in collaborating with Dr Richard Foster, the chemist leading the screening process. At around the same time, during my rotation in the Whitehouse lab, I found early evidence that the human TREX complex, responsible for cellular bulk nuclear mRNA export, is ATP-dependently remodelled and that this might be essential for the ability of the oncogenic herpesvirus Kaposi’s sarcoma-associated herpesvirus (KSHV) to replicate. Both, my initial findings and my interest in a collaboration with chemistry, seemed to fit extremely well together to form a PhD project. When it came to making my choice, this, together with Prof Whitehouse’s enthusiasm for his work, swung me to keep researching this topic. At this point, life as a new scientist and my research were (mostly) fun and giggles. The lab was made up of an excellent bunch of people, all of whom I made friends with easily. We enjoyed things such as biscuit Mondays, Wednesday cake clubs and doughnut Fridays (for average weekly intake of sugary items as a PhD student in the Whitehouse lab, see photo) and any future publication, although always an ambition, seemed far away. Things were going well, results came in and I was happy just pottering along and doing my research. Things continued in that pattern, good times in the lab and research were followed by some stumbling blocks. I learned and progressed and got better at my work, too. One of the main and most exciting finding of this research is that our compound was not only active against KSHV, but because it targeted an essential cellular interaction partner of viral proteins, could also inhibit other human herpesviruses, as shown for HSV-1 and HCMV. Timing wise this came just months before I was due to submit my thesis. At this point, I was excited about this result because it made me confident in submitting a good thesis, as well as realising how it would strengthen a future publication. And so I submitted my thesis and passed my viva, with lots of praise and compliments from the examiners. My second encounter with someone scrutinising my work shortly after, the peer-review of the submitted paper, was a bit less thrilling. Though the reviewer’s suggestions inarguably strengthened the resulting paper, it never feels nice to be told to do more work to support the original findings. However, we were lucky in that Prof. Whitehouse and Dr. Foster obtained a Postdoc grant for continuation of this work, so I could stay and tackle these issues myself. While that was great, for the first time research also became stressful. With each passing month that the paper wasn’t accepted I felt the risk and pressure increase. Leaving your PhD without a publication, O.K., leaving a PhD and Postdoc without a publication, not so good. But, as you can tell by reading this, the story had a happy end for me. Now, just a few weeks after we heard the paper got accepted, and a few months before my grant runs out, I feel like I have spent a very long time on this project. Together with my awesome supervisors I’ve grown it from a seedling and nurtured it into this complete project, just like me, turning from a student into a new scientist. At the same time, I truly feel I am ready to move on to a new project now. Maybe the most exciting thought is, however, that even as I see this as the end of the “finding the hit compound” part of the project, it is really only the start to the medicinal chemistry side of the project to develop a compound fit for purpose in the clinic. 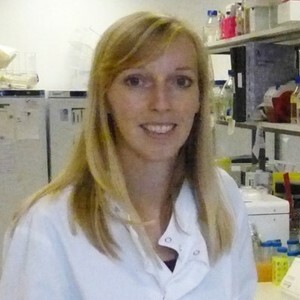 What an inspiring story - and great to have some more virology on the community! Well done for persevering through the lows while enjoying the highs. Every project is a journey and it was great to read about yours in putting together this paper, glad we could be there to help bring this to publication!